Krack Shot Kroc is the twenty-fourth level in Donkey Kong Country 3: Dixie Kong's Double Trouble! and the fourth level of K3. 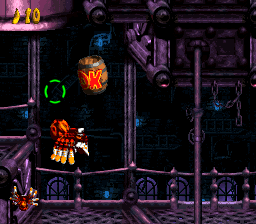 For most of this factory level, the Kongs play as Squitter, who must create temporary web platforms to travel throughout the factory. This includes traversing large gaps or going up to higher platforms. The main obstacle of the level is Kroc, who is represented by a crosshair that shoots individual fireballs at Squitter. A warning sign at the start of the level even warns when it begins aiming at Squitter. At times, Squitter can hide behind a metal wall to evade Kroc's fireball attacks. 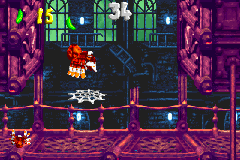 In one of the Bonus Areas, the player plays as Kroc, who must blast each enemy within the time limit. Red Buzzes are a secondary hazard, as they patrol different areas of the factory, and Squitter cannot defeat them alone (only by having Kroc blast at them). Other enemies in Krack Shot Kroc include Bristles and Re-Koils. Krack Shot Kroc originally featured a hyphen in its title, "Krack-Shot Kroc", but this was omitted in the Game Boy Advance version. The level begins with a straight pathway into a small gap. Jumping into this gap takes the monkeys into an Animal Barrel containing the spider buddy, Squitter. The apes turn into the spider inside of the barrel and then fall through the rest of the small gap to land near the letter K. Squitter must head down the path to the right and defeat a few Bristles with his webs. Shortly after building web platforms to reach the top of a ledge, he should meet the Kroc, who tries to attack him throughout the rest of the level. There are a few Bristles in this area, whom must be defeated by Squitter. A few stair-like platforms are also farther into the level. The spider needs to climb them and build web platforms to the area in the top left corner of the screen. There, he can find a straight pathway leading across a pit of fire, along with some Bristles. After crossing over another fire pit, he should find a high ledge leading to the next area, where he needs to climb upwards with his web platforms and find two more tubs of fire. Crossing them and a lone red Buzz, he should find the letter O above the next two pits. There is a Star Barrel right after this area, and it marks the halfway point when hit. About halfway into the level, Squitter needs to pass another two tubs of fire and travel upwards around several Buzzes to reach the next floor. On this floor, there is another tub of fire to cross, as well as a pathway down the area. The letter N is not too far from here, and it is located above the next two fire pits. Squitter must cross the pits and move through a narrow, Re-Koin infested passage to notice more fire below him. After crossing it, he should climb upwards again and head right at the top floor. There is a dead-end at the end of this pathway, so Squitter's only option is to use more of his web platforms to climb upwards, dodging a few Buzzes. There are a few more Re-Koils at the top of this area, as well as more tubs of fire. Squitter has to cross the three pits and head past a "No Kroc Sign". At that point, the Kroc stops following the spider, so he can safely travel into the nearby gap, where a No Squitter sign can be found. Crossing it turns him back into the Kongs, who must then raise the flag on the nearby flagpole, ending the level. To get to the first Bonus Barrel, the Kongs have to move all the way to the right after meeting Kroc. While going up, there is a fork. If Squitter chooses to jump up to the left, he should enter a Bonus Area. In this bonus room, Squitter must grab 15 Green Bananas. The bananas continuously appear over a large pit that can only be crossed with Squitter's web platforms. After grabbing 15, a Bonus Coin appears. The Kongs can find a red Buzz circling the area a little after the Star Barrel. If they go upwards past this Buzz, they should find a Bonus Barrel. 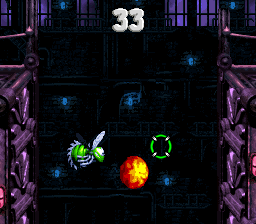 In this Bonus Area, the player controls Krosshair and must shoot the eight Re-Koils and the two Buzzes found in the room. The Re-Koil bounce in and out of cover, while the Buzzes fly in circles. If all enemies are attacked within 45 seconds, a Bonus Coin appears in the upper-middle section, and it must be shot at as well. At the end of the level, Squitter turns into a Steel Keg after passing the No Animal Sign. The Kongs should pick up this barrel, jump on top of the nearby Koin, and throw the barrel at a nearby wall. This defeats the enemy, rewarding the Kongs with its DK Coin. Squitter jumps from behind a wall. Squitter near the letter O.
Squitter jumps over a red Buzz. Squitter goes behind a wall for cover.